Donald Trump confidant Roger Stone appears in court following his arrest in Fort Lauderdale. NBC 6 has team coverage. President Donald Trump's confidant Roger Stone has been charged with lying about his pursuit of Russian-hacked emails damaging to Hillary Clinton's 2016 election bid. Prosecutors allege that senior Trump campaign officials sought to leverage the stolen material into a White House victory. The self-proclaimed dirty trickster, arrested by the FBI in a raid before dawn Friday at his Florida home, swiftly blasted the prosecution as politically motivated. 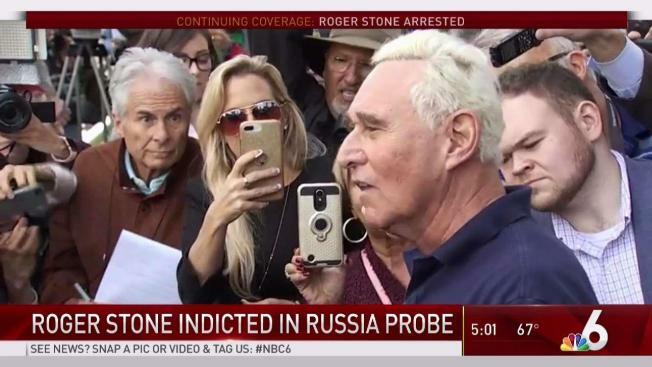 In a circus-like atmosphere outside the courthouse, as supporters cheered him on and jeering spectators shouted "Lock Him Up," Stone proclaimed his innocence and predicted his vindication. The seven-count indictment, the first criminal case in months in special counsel Robert Mueller's investigation, provides the most detail to date about how Trump campaign associates in the summer of 2016 actively sought the disclosure of emails the U.S. says were hacked by Russia and then provided to the anti-secrecy website WikiLeaks. It alleges that an unidentified senior Trump campaign official was "directed" to keep in contact with Stone about when stolen emails relating to Clinton might be disclosed. The indictment brings the investigation even further into Trump's circle of advisers and suggests campaign officials were eager to exploit the stolen messages for political gain. But prosecutors did not accuse Trump of wrongdoing or charge Stone with conspiring with WikiLeaks or with the Russian intelligence officers Mueller says hacked the emails. They also did not allege that Trump aides knew in advance of the hacking. The prosecution mirrors other Mueller cases in alleging cover-ups and deception, accusing Stone of lying to lawmakers about WikiLeaks, tampering with witnesses and obstructing a House intelligence committee probe into whether the Trump campaign coordinated with Russia to tip the election. Sarah Sanders, Trump's press secretary, said the charges brought against Stone "don't have anything to do with the president." She didn't directly answer questions on whether Trump directed a campaign official to contact Stone about stolen emails and wasn't aware of the Justice Department giving the White House notification of the arrest ahead of time. Trump attorney Jay Sekulow said the indictment "does not allege Russian collusion by Roger Stone or anyone else." Trump, in a tweet Saturday, said that if Stone "was indicted for lying to Congress," then "what about the lying" by top law enforcement and Obama-era national security officials, though he presented no specifics to support his assertion of such "lying." A friend of Stone's, "Manhattan Madam" Kristin Davis, told NBC News that federal authorities also raided a Manhattan apartment that they used to share. Though not uncommon for the FBI to make early-morning arrests of targets under indictment, it's the first time Mueller has used that tactic. In court papers, prosecutors wrote they had concerns that if Stone was tipped off to the indictment, it would increase the risk he would flee or destroy evidence. Hours after his arrest, Stone appeared in court in a blue polo shirt and jeans. In releasing him on $250,000 bond, a magistrate judge restricted Stone's travel to South Florida, Washington and New York City and ordered him to avoid contact with witnesses. He's due Tuesday in a court in Washington, where the case was filed. 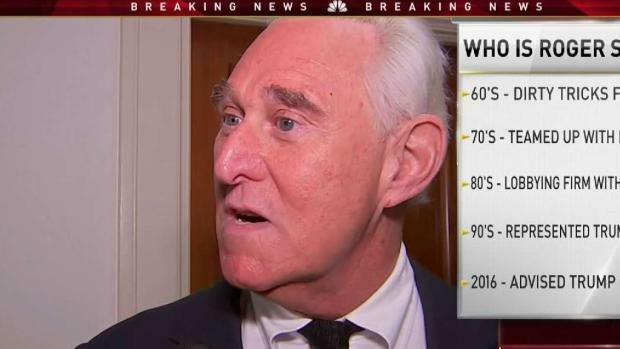 "This morning, at the crack of dawn, 29 FBI agents arrived at my home with 17 vehicles, with their lights flashing, when they could simply have contacted my attorneys and I would have been more than willing to surrender voluntarily," Stone said outside court. Known for his political antics, conspiracy theories and hard-ball tactics, Stone has reveled in being a Washington wheeler-dealer dating back to former President Richard Nixon's administration. On Friday, he mimicked Nixon's famous "V'' gesture as he left the courthouse. Stone, a longtime friend of the president's, briefly served on Trump's campaign, but was pushed out amid infighting with then-campaign manager Corey Lewandowski. Though sidelined, he continued to communicate with Trump and stayed plugged into his circle of advisers. The indictment says Stone repeatedly discussed WikiLeaks in 2016 with campaign associates and lays out in detail Stone's conversations about emails stolen from Clinton campaign chairman John Podesta and posted in the weeks before Trump beat Clinton. The document says that by June and July 2016, Stone had told senior Trump campaign officials that he had information indicating that WikiLeaks had obtained damaging documents on Clinton. After WikiLeaks on July 22, 2016, released hacked emails from the Democratic National Committee, the indictment says, a senior Trump campaign official "was directed" to contact Stone about additional releases and "what other damaging information" WikiLeaks had "regarding the Clinton campaign." The indictment does not name the official or say who directed the outreach to Stone. That question was the most significant detail in the indictment, said House intelligence committee chairman Rep. Adam Schiff, D-Calif.
"Our Committee will be eager to learn just who directed a senior campaign official to contact Stone about additional damaging information held by Wikileaks, one of the publishing arms of Russian government hackers," Schiff said in a statement. While the indictment provides some new insight into the Trump campaign, it deals largely with what prosecutors say were Stone's false statements about his conversations about WikiLeaks with New York radio host Randy Credico and with conservative writer and conspiracy theorist Jerome Corsi, who rejected a plea offer from Mueller last year. The indictment says Stone carried out a "prolonged effort" to keep Credico from contradicting his testimony before the House intelligence committee. During that effort, prosecutors note that Stone repeatedly told Credico to "do a 'Frank Pentangeli,'" a reference to a character in "The Godfather: Part II" who lies before Congress. Stone is accused of threatening Credico, including through messages in which he called him "rat" and "stoolie." He also threatened to "take that dog away from you," a reference to Credico's dog, Bianca. Stone has said for months he was prepared to be charged, while maintaining he had no inside information about the contents of the emails obtained by WikiLeaks or the timing of their release. Still, he has long attracted scrutiny because of his WikiLeaks-related comments, especially a 2016 tweet — "Trust me, it will soon (be) the Podesta's time in the barrel" — that appeared to presage knowledge that Podesta's emails would soon be released. In a tweet Friday, Podesta turned Stone's words against him, writing that it was now "Roger's time in the barrel." Associated Press writers Michael Balsamo, Jonathan Lemire, Jennifer Kay, Terry Spencer and Kelli Kennedy contributed to this report.